Nuruddin Farah is a Somali novelist, who has written plays both for stage and radio, as well as short stories and essays. From a Crooked Rib is his first published novel (published 1970). The novel is centred on the life of its main character Ebla; the book takes us from her maiden days to her life as a married woman. 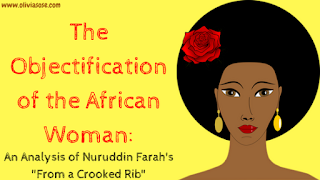 A predominant theme in the novel is the objectification of women in Somali, Africa. Objectification is the process or manifestation or action of degrading someone to the status of a mere object and thereby denying them dignity. The novel gives explicit and implicit examples of how women are regarded as nothing but possession to be owned and done away with as permitted by religion, culture, and society. The novel opens with eighteen-year-old Elba who runs away from home because her grandfather gave her out in marriage to a forty-eight-year-old man, although she had younger suitors, her grandfather choose Giumeleh. We see the grandfather’s reaction and the effect of her elopement from the dwelling; he cursed her, not because he found her action heartbreaking (after all his wife had eloped with him when they were younger) but because he was bitter that he had no one else to look after him. Ebla who at first is concerned for her grandfather’s welfare later decides to execute her plans, the reason being that after all, he had exchanged her for camels. The above is a rhetoric question, which requires in-depth reasoning and reflection from the reader. She decides that although a man and a woman need each other, but not at the same degree. Ebla escaped to Belet Wene where she went to her cousin’s house (Gheddi) and served as a maid servant for his pregnant wife (Aowralla). There she met the widow (whose nephew she later married). The widow narrates the story of her first marriage to Ebla, the story significantly draws a comparison between her Arab husband and the male monkey. Ironically, Ebla who runs away from a forced engagement is given away by her cousin (Gheddi) to a broker. The broker offered him money for her dowry which he used to pay the fine charged by the police. Thus, there is no difference between her and a cattle. Her cousin didn’t bother informing her about his exchanging her for financial assistance but instead, the widow informed her. She was to be married to the broker, a man very sick with tuberculosis. Here again, we see Ebla question the purpose for marriage. She realized that enslavement and not love or friendship was what existed between the married couples she had met; the woman was the slave. She also realized that most women got married simply for the sake of living a married life and thus, avoiding spinsterhood. Ebla steals control of her life by eloping with Awill; she decides that she would not marry any man unless she chooses him. The above statement further buttresses the fact that in addition to being oppressed, women are also forbidden from crying out; they are expected to keep mute and bear the pain in silence, therefore showing no emotions like inanimate objects. We see how culture has helped in the oppression and reification of women. She decides that if Awill rejects her upon his return she’d remain married to Tiffo. We see here that Ebla’s whole existence depends on her being a wife. What else could life possibly be outside marriage? She fell fulfilled only as a wife to someone, it doesn’t matter whose.